Day three is done… and boy am I thankful!!! Crap, this race is severely tough. Really, really tough. I went to bed last night staring up at the sky and wishing that I wasn’t seeing such a beautiful display of stars…Clear skies are definitely NOT what we want here! The moon was out and shining brilliantly, which at least helped light the way to the portapotties. Zandy in my tent must have gotten in very late again because when I woke up in the middle of the night he was lying on the ground beside me, just outside the tent. I am so impressed by the tenacity of the other runners who spend ALL day out on the course and pretty much have to go right to sleep when they get into camp…with very little recovery time it is amazing they have the guts to start all over again the next morning! We’ve lost two people from our tent so far. Bradley left yesterday and today unfortunately Natalia had to drop out, much to her disappointment. She went over on her ankle before checkpoint 1 and it ballooned up. I have no doubt that if she was able to continue on, she would have. It is hard seeing people forced out of the race who truly just want to participate…all those months of training… We will definitely miss Natalia in the tent – her positive energy was infectious!! 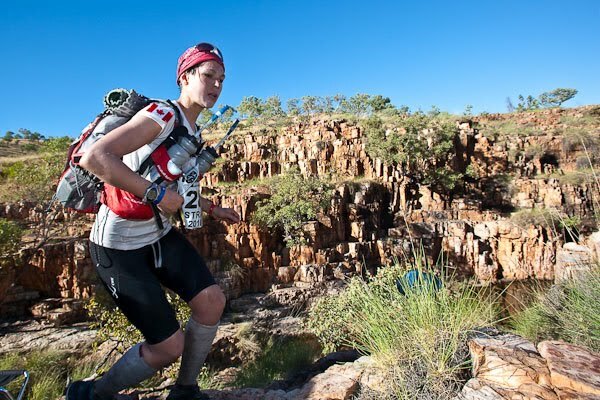 But she will warm up the finish line for us and we’ll toast her amazing strength with two cold beers at emma gorge…mmm, too early to start thinking about that now! The day began again at 6am and as I feared, it was clear skies all around. 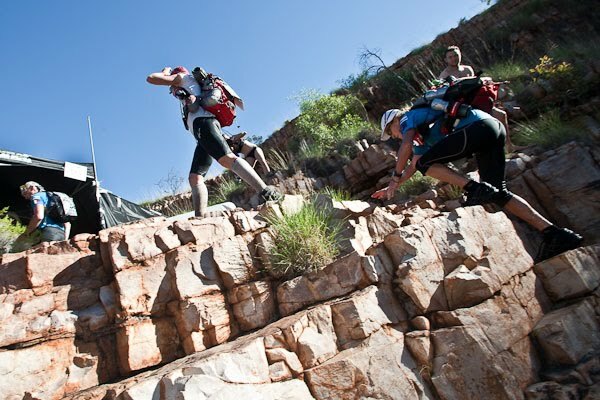 Although the course was shorter today (34k), with the heat it felt just as brutal as the previous days. Up to checkpoint one the scenery was gorgeous, but it was hard to notice with all that huffing and puffing! The sweat poured down my face and over my sunglasses, obscuring my vision. The footing up until now has been pretty treacherous, but that first stage today was positively insane. Even the leaders were forced to walk, so we all walked in a file for the first hour and a half. 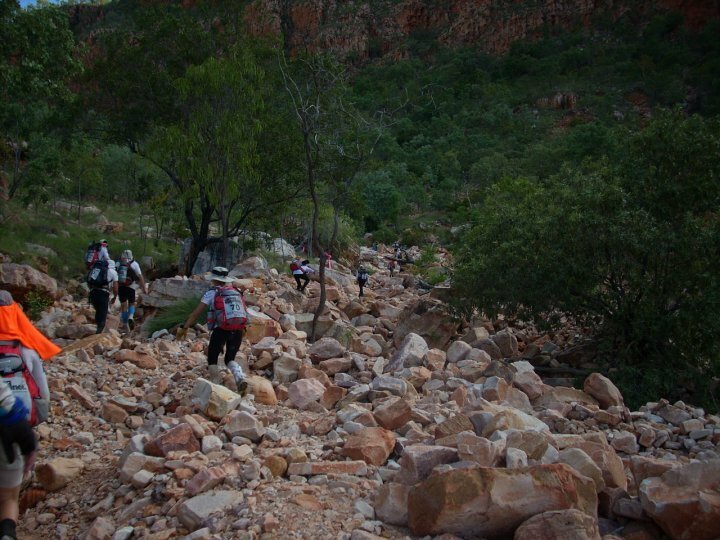 An 8km death march into the checkpoint by the waterfall. So many hidden holes, streams, muddy patches, sinkholes, spinifex, hidden logs, twisted roots, barbed wire (yes! barbed wire! ), bog, and rocks. Small rocks, large rocks, loose rocks….I can’t tell you how many times I fell over. My ebola legs look ready for amputation. Between the mossie bites, the bruises, and the thousands of pricks from the spinifex I could easily be the “before” photo for some extra strength medical lotion. The biggest problem with falling was that each time I would end up stretching beyond was I was used to and I would pull a muscle. Adductors are screaming (James, get those IMS needles ready in London when I return!!). At the waterfall at checkpoint one I wet my head buff and forged onwards. The field was still pretty tight at that point, which wore on me mentally. You couldn’t ever really get a break – there was always someone behind you pushing the pace or someone ahead who seemed to have more energy. Running through the grass meant that we had to pick our feet up quite a bit to clear the clumps – like a ‘knees up’ soccer ball drill. But I hung in. The faster I finished, the faster I would be out of this heat!! Barb, amazing firefighter/ironwoman aussie Barb, ran an amazing race today. She powered up the rock climbs and trucked along the flats. It was so inspiring to see – this woman is 51 people!!!! 51!!!! Wow. She never looked tired. We stuck together at almost every stage. Whenever I was in front and thought I was pulling ahead I would look behind and she was right on my tail. It was actually pretty motivating – I knew I couldn’t ease off! At one point Barb and I ran with a group of about 4 other male runners, including Mehmet from Canada and Peter (aka dark horse), the 2:30 marathoner. I led the group for part of it, which was pretty cool – a couple said that I led a good pace and that I gave them a bit of a boost. AWESOME!!! Ha, of course as soon as we emerged from the grass and hit the road I stopped and waved them onwards. For the last 8.7 km from checkpoint 3 to the finish I asked Barb if she wanted to run with me so we could pace one another. We are so evenly matched, I thought that maybe we could help each other get through that last brutal 5km.I think it worked brilliantly. She thanked me for helping her through the last part but I think she was just being humble – it was definitely Barb that pulled me along! The last 4 or 5 k or so was all on dusty road… the sun was beating down on our backs and there was nothing but a long road ahead. At some point Gabriel (my tentmate and former olympian…in no order of importance, ha) caught up to us. He was out of water, thinking that we were almost at the finish. Because I was wearing my polar watch (RS800), I was able to track the distances and I knew we still had 2.7k to go. Gabriel ran with us and the three of us pushed one another along. “Let’s run to that yellow sign up there…” Then we would take a little break and someone would call out the next running point. I was really suffering, but I just wanted to get to camp as quickly as possible. As we came down the final stretch, a small plane landed on the road we were running on. I shouted out for them to take me away, but strangely enough they didn’t stop! Gabriel, Barb and I rounded the final corner to the row of flags that marked the end of the stage. We ran across the line hand in hand, very relieved to put this stage behind us. Now I will come to the chaffing. Again. I can deal with the back. I mean, it is itchy and uncomfortable, but I can deal. Today came the inner thigh and rear end chaffing. Now THAT is painful. I lay on my stomach for about an hour in the medical tent while the doctors tried to figure out how to tape it up, but alas, nothing can be done… It is so painful. When I took off my shorts there was dried blood all over the backside. EEP! I’m walking around camp with just a jacket tied around my waist, hoping and praying I will be able to push through this tomorrow!! I have never felt like such a lady!!! We have a view of beautiful hills and red rock cliffs from our camp, which I would enjoy more if I didn’t know that we would have to scale them tomorrow! I reckon Barb will do brilliantly tomorrow and I will be very, very pleased if I can struggle to keep up third place. In these conditions, it really is just about surviving! sadly, one of the japanese competitors got a very serious head injury out on the course today and had to be rushed offto the hospital – another reminder of the brutality of this sport and of this race. I should mention that my polar product has really saved me. Being able to measure the distances between checkpoints has allowed me to guage my water consumption — and mentally helps push me along! I’ve been calling out the distances for the other competitors as well. Many have brought Garmin GPS units, which I’m sure are great in training but absolutely useless in a race like this. The garmin battery only lasts 6-10 hours, so it really doesn’t work on a multi-day race. My polar RS800 works through water, sand, road, and bush and the battery will last until at least next year! Still gutted that I don’t have my oso bite plate. I am going to try wearing half of it tomorrow. If anyone is interested in learning more about this, please contact David Cook at London Holistic Dentistry on Harley Street. I will post more about this on my normal blog in a couple weeks!!! (And yes mom, I can only update my RTP blog from here, not my normal blog… We don’t actually have internet access here! RTP just downloads the messages once a day and then uploads them to these laptops). Thank you THANK YOU THANK YOU for your messages. They have made me laugh, smile, and tear up a bit. The words of encouragement from family, strangers, new and old friends alike have been incredible. But Kim and Ben (my siblings!!!) where are you??? Thank you to my dream team back in London especially – David Cook (for the OSO bite plate), Steve Bessant (neuromuscular skeletal specialist at the Bowskill Clinic), JAmes Pinkney (IMS practitioner at the Bowskill Clinic), Petrus DeJager (massage therapist at the Third Space gym), Dr. Simon Costain (podiatrist at the Gait and Posture Clinic), Renata (cryotherapy at Champneys Spa), Phil Learney (strength and conditioning coach at the Third Space gym)…. who am I missing??? And thank you to my friend from Champneys for taking the time to send me a message – your support was a welcome and very lovely surprise!! Paul and Chloe, send me some Australian strength! Mark, Jenna, Alex and Belinda, your RTP wishes are much appreciated!!! LOVE TO ALL – keep those messages coming!!! !